Arguably, the best way to learn anything is through practice, practice, practice. Want to learn to play the piano? You gotta practice. It’s just how we’re built to learn. Up to now, the main opportunity for practice within any Conceptual Academy course includes our hands-on activities as well as the numerous questions at the back of each chapter of each of our textbooks. These are still very much available. But this summer 2018 we introduced a new homework system built around a test pool of about 5400 revised exam-like questions, which means they’re relatively tough questions (much like in the textbook). This allows further opportunity for the student to push the envelope for deeper understanding. With this system there will be an automated homework “session” for each lesson. How about 10 questions for each lesson? Hmm, how about 100?? Yes, we’ve gone for broke. We’ve opened up our entire test pool. All 5400 questions are now available, which corresponds to up to 100 questions per lesson. Each student can practice to their heart’s content based upon their individual needs. They get a question wrong? No problem. No penalty point deduction. The student just moves onto the next question, again, to their heart’s content. . .till they tire out, but, please, no more than that. Practice is only effective with good energy. The goal here is to encourage the student to practice. There’s a point reward for each correct answer. Yeah! But that’s not the main goal. The main goal is encouraging the student to practice to an extent that matches their needs and ambitions. Multiple choice? Yes, they’re all multiple choice. But they’re all also short answer. How can they be both?? Interested? That’s the long of it. Read on! There’s quite a bit to describe here, all of which will be provided in the updated user manual for each course. So, you are welcome to stop reading right now. Thank you for trusting us when we say this new homework system is really awesome. However, we know well that the homeschool community is very much into the details, which is something we are rather into ourselves. So, you are also welcome to read on. Some details may not sink in right away. But in the least, we hope you find our enthusiasm shines through. It all began with our reading and video quizzes. Every Conceptual Academy course features what we call “reading check” and “video check” quizzes. These are quizzes with low level questions. Their main purpose is to help the student make sure they have captured the main points from either their textbook reading or from a particular video. They are also a means of providing the student credit for staying on task. Receiving this credit is exceedingly important. We all appreciate recognition for significant effort put forth. Colleges using Conceptual Academy typically require students to work on these reading and video quizzes as a semester-long assignment worth up to 20% of their overall course grade. In a typical Conceptual Academy course there can be over 750 reading and video check questions! The student earns 2 points for each correct answer when answered BEFORE the lesson due date, but only 1 pt (50%) if answered correctly AFTER the lesson due date. We call this a 2/1 system, which means about 1500 points are possible (750 x 2 = 1500). The instructor, however, requires the student to earn only about 600 points (sometimes more or less depending upon the instructor). 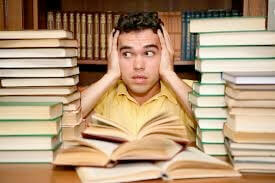 Students really appreciate the deadline, but they’re also not killed if they miss a particular deadline. Life happens. Work. An illness. Bad weather. Internet disruption. Family responsibilities. The role of the instructor becomes that of a coach. The instructor sees the points collected by the class in real time and has an important metric as to their actual time on task. Mostly, this allows the “coach” to act accordingly, which typically means spiriting the students along in their study habits. Over a third of the class is far exceeding the point requirement. From campus to campus, the shape of this histogram is remarkably consistent. It looks the same whether the instructor sets the threshold at 200 or 400 points. It was then that we realized we were onto something. In a traditional homework system all students start out with a high score. For example, say the first assignment is made easy to help keep a positive attitude at the start of the course. Say all students earn a 100%. From the student’s point of view, so far so good. They’re excited. But then as the course progresses, things naturally start getting more complicated. The aim of studying is to minimize how far you get cut down from this early high percentage score. The go-getters might be incorrectly answering only 10% of the questions and thus are able to maintain a 90% for an “A” letter grade. Yeah for them! Others might follow a different path of getting cut down all the more. But the theory goes like this: The more you study, the less you get cut down. This is the premise of what we call a “Penalty-Based” assessment system. You study not to practice, but to avoid the penalties. In such a system, the focus is on surviving the rough. Those who swim the best, sink the least. This is all flipped in what we call an “Encouragement-Based” assessment system, as is what we discovered with our reading and video quizzes. In such a system, all students start at zero, which is natural because most of the students are simply not yet familiar with the material. As the course progresses, the students are challenged with questions that probe their level of understanding. They earn points with each correct answer, but no points for each incorrect answer. There are numerous questions within the test pool to provide ample opportunity because, after all, the WRONG answer a student provides can be just as valuable, if not more so, in terms of the learning experience. Is it really proper for a student to lose points when they are learning the most? In our opinion: Absolutely Not. So here’s the punch line: In a Penalty-Based system, students are cut downward. Within an Encouragement-Based system, the students build themselves upward under the expert guidance of the course instructor who is there to coach them along to improved learning. The instructor coaches, in part, by setting a required threshold of points, for example, 600 points, and providing other incentives (not mentioned here) along the way. 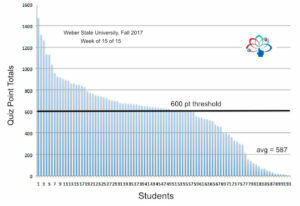 All students who earn this 600 points by the end of the semester have EARNED a 600/600 = 100% on this assignment, which counts for up to 20% of the overall course grade. The response from college instructors using this system at Conceptual Academy has been very positive. It works at helping to hold students on task. Students are held accountable as well as rewarded. But this system was built only around our video check and reading check quizzes, which contain lower level types of questions. Could we do something similar involving tougher questions that would be a more appropriate as a prep for the much more challenging unit exams?? The answer is YES. It’s been quite the task but we are most excited we met our release date of August 2018 — the system is now live! But wait, there’s more! We’ve set this up as similar to but not identical to the reading/video quizzes. For example, with the reading/video quizzes there are a fixed number of questions per quiz. For the new “Homework Practice Session” (and there’s one for every lesson) the student is presented only one question at a time, just one. Short and sweet and focused. The question is first presented as a short answer (not graded, but great for a warm up) followed by the multiple choice version of that same question (for points). The student can then click the “NEXT” button for the next question. Again, and again, and again, (Practice, practice, practice) for as long as they wish, but to the limits of the size of our test bank, which is up to 100 questions for any one Homework Practice Session. We assume about 15 questions will suffice for a single session for the average student. The student collects points for each correct answer. Much like a video game but where points are earned not for killing monsters, but for understanding. Each student’s Conceptual Academy grade book will track points earned from these “Homework Practice Sessions” (HPS) as it already does for the reading/video quizzes. There will be a recommended threshold of total points for each self-study course, but this is only a recommendation. We ask that you ignore the percent correct (penalty-based) and focus on points earned (encouragement-based) keeping in mind that the goal at this point is not assessment of what has been learned, but rather encouragement to practice so that the material can actually be learned . . . where both correct and incorrect answers are valued. When you think of the HPS, think “carrot”. It’s a carrot system designed to help move the student forward. But don’t get us wrong. We are also fans of the “stick”. The best coaches know how to apply that balance of both carrot and stick leading to a winning season. For the stick, we still have our Conceptual Academy unit exams, which your student will find to be quite the challenge, especially given their team-based “pyramid” format. But with plenty of practice, it will be a challenge met with success. You will find many winning seasons. The Homework Practice Sessions (HPS) is now live for the 2018-2019 academic year and beyond. This new feature applies across all courses offered at Conceptual Academy. Your support is greatly appreciated and helps to pay it forward to the further development of our novel Homework Practice Sessions as well as the other amazing features of Conceptual Academy. Thank you so much for this support. And, as always, please write to us with any questions you may have. We look forward to hearing from you. Write to Support@ConceptualAcademy.com.